Happy Howloween from Wags and Walks! Halloween is one of our favorite holidays here at Wags and Walks, because what is more fun than dressing up your furry family members? Whether you are bringing your pup to a holiday office party or letting him/her lend a hand in giving out candy, there is nothing better than getting creative and seeing how funny (or cute!) you can dress up your pup. 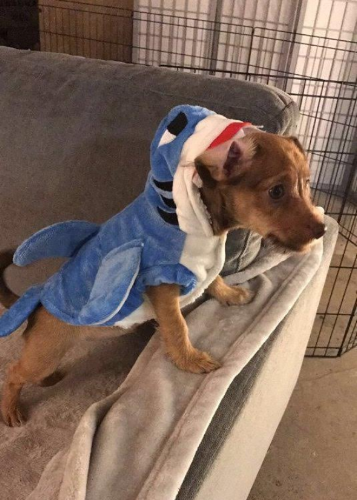 In honor of today, we are excited to share some of the most spooktacular Halloween costumes we’ve seen from a few of our favorite Wags and Walks alumni! Have you ever seen a cuter tarantula? We wouldn’t mind finding this creepy crawler in our room! Rolling Stones, who? This dynamic duo is the only live concert we want to see! Introducing Pete, the newest top pumpkin patch model! We are dying to see a remake of Jaws with this Great White Shark! Oona and Coco to the rescue! We all know that our rescue pups really save us, not the other way around. This is the cutest rendition of Yoda that we’ve ever seen, hands down. May the force be with you! This 90’s pup is bringing beanie babies back in style! We hope you’ve enjoyed these Howloween costumes as much as we have. From all of us at Wags and Walks, we hope you have a wonderful holiday filled with funny dog costumes and plenty of treats - including some dog friendly treats for our pups! Please follow us on Instagram, Facebook, Twitter and Snapchat (username: wagsandwalks). Also, don’t forget to sign up for our e-mail newsletter, and check our website for other available dogs. Who doesn’t love cute animal pupdates?